It stands on its own little feet, but it will be trapped by plaster and tiles eventually. AFIK, Edmundo has no plans to actually fasten it to the wall, but I could be wrong, and dread to thing what would happen if it did move. I have no plans to get jiggy in there, but Hayley and I did get a corner bath off its foundations in a posh hotel once. 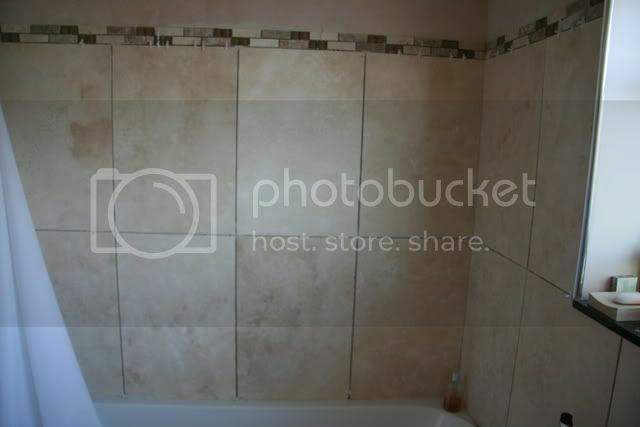 Paster and tiles won't hold a bath and any movement could crack your grout. and lead to water ingress down the back (It doesn't take much). If it were me, I'd fix it to the wall now and save a load of aggro later. Ed says it wont be going anywhere once we have got it in its final position. I started today by geting the old floor up (board nailed to the floorboards) with the trusty bolster chisel and big hammer. To save time I chucked it out of the window as I went along. 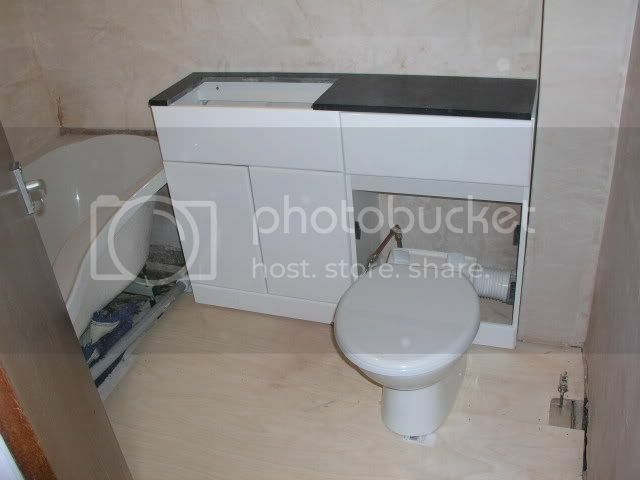 We then fitted the new loo in place. 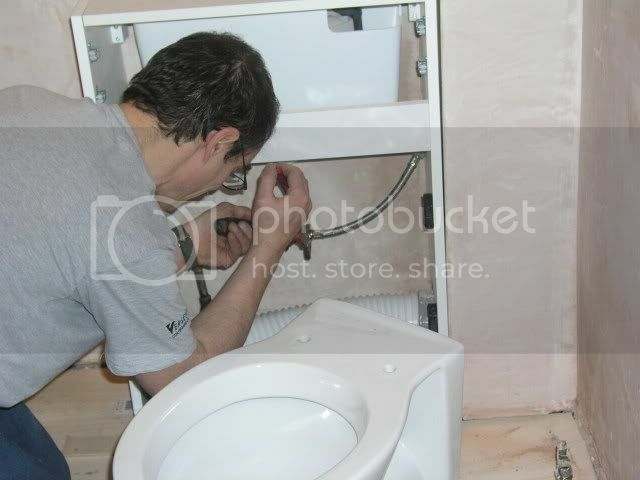 Tonight we are still on bucket flush, we didn't have the adhesive to make the cistern - loo pipe watertight. Here Edmundo fits the water feed. notice the plaster is now a nice pink, I bought a shedload of cheap white emulsion to undercoat it with. Finally for today we tried the sink unit and granite worktop in place, it JUST fits. 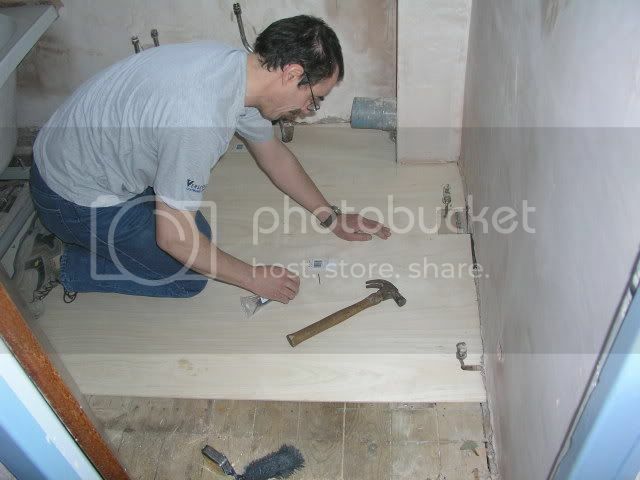 Tomorrow we will fit the sink and finish off the loo, Ed is coming very early, something I don't usually do on Sundays. Going to be real nice, Roy! Wonders what the progress would look like if a lad were doing it? /\/\ A lad would want all the money first to buy the stuff, then never be seen again. probably happens to all their DIY projects, Soludo's bathroom blog is a short one, 'set off to B&Q, changed my mind and stole the fund'. 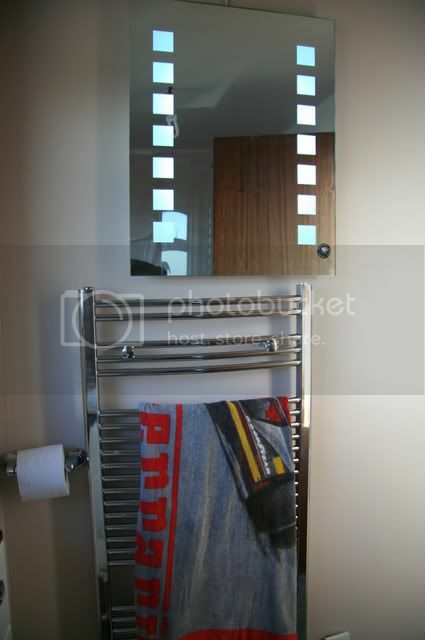 Still no loo roll holder, it won't go up until the wall's painted, same as the towel radiator thing. The hoopy bath taps I got off eBay to match the sink mixer tap went in next. At first we had a leak, which is why there are emergency towels under the bath. Only a small drip into the kitchen below. We finshed the floor, when Hayley came back from her mountain biking she had the first bath, and wanted it with blue water like in the bath catalogue. Good job she didn't want rose petals like the baths in MFI, that would have blocked the waste trap. The waste is a popup sprung thing btw, no plugs or rods involved. Painting the walls white today (as undercoat) Tonight we may get the bath side panel on. Getting more scared of the tiling now, a friend has been trying to stick travertine tiles up, which fell off and broke his shower tray. I have the same bin as you. It's starting to look really good, roy. Best of luck with the tiles. I've never tried, although I will turn my hand to most DIY tasks. I'm always worried I'll break more than I get fixed to the wall, and I know someone who can do a much better job for a few beers, much like your Edmundo. Ya know if someone would have told me 20 years ago that I would be watching the progess of someone redoing their bathroom via a computer I would have told them they were nuts. 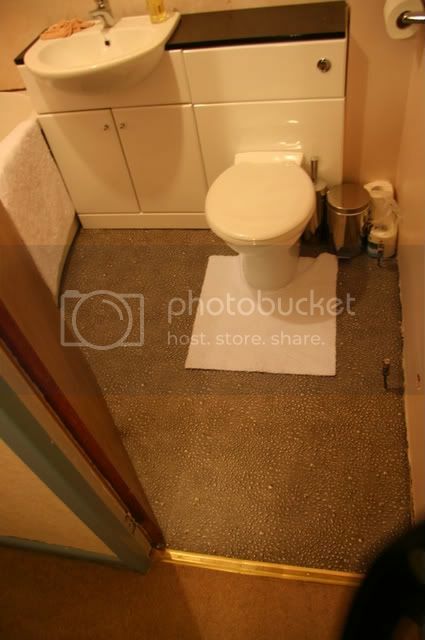 Now you have given me ideas on what to do with my bathroom. Thank God for the interenet! Great job. Hey, I got one of those bins too; what an elite little club we have. Looking good there Roy. I like the pop-up waste, I fitted one in mine too. Ours is in the centre of a double ended bath and one thing we found is that they can be "popped" by accident when you move about. Had a most amusing moment when Mrs E laid back to relax and a couple of minutes later found herself in an empty bath. 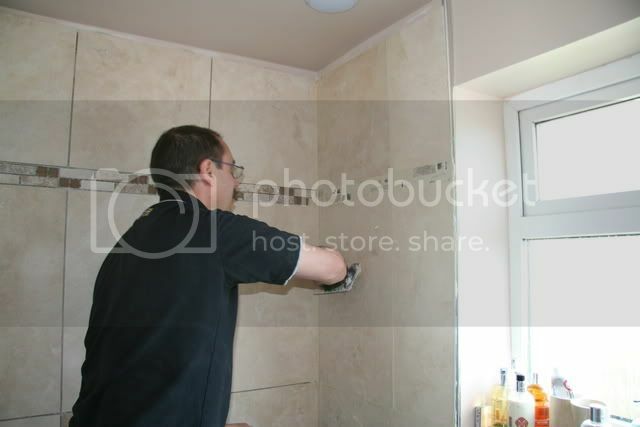 @8 - tiling is not too difficult, no worse than wallpapering, the secret is to make sure you start from a straight line, so never start from the skirting or a worktop unless it is level; better to nail a bit of batten to the wall and tile up from that, then when it's gone off, remove it and tile down. It's really looking good Roy. I have a question. Why is it necessary to use a pump for the shower? Is the water pressure too low there? I have never seen that used. Keep up the good work! You will love the tile. 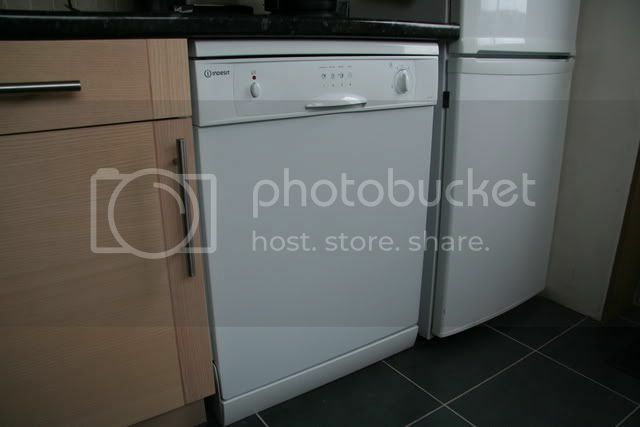 I recently did my kitchen floor, and what a tremendous difference. It's a lot of work, but well worth it. 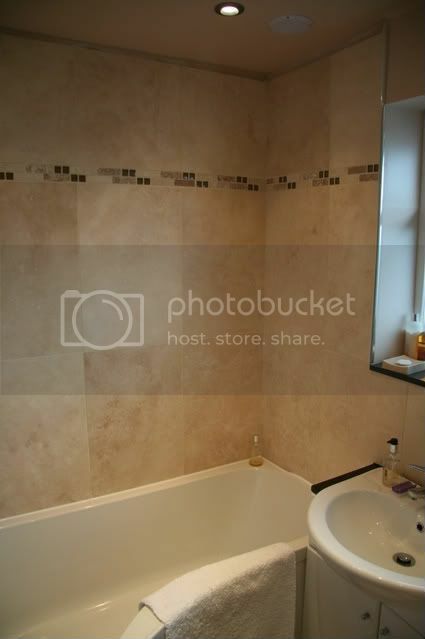 If someone told me 20 years ago (when we moved in) I'd be doing the bathroom, and updating people on my computer I'd have laughed, I think I only had 3 colours on my PC then, and no interest in DIY. Nowadays I take the attitude that if I can build a motorcycle from scrap, I must be able to tart up a room. The shower screen went in tonight, no more plastic sheet hanging from a bit of string tied to the light fitting. 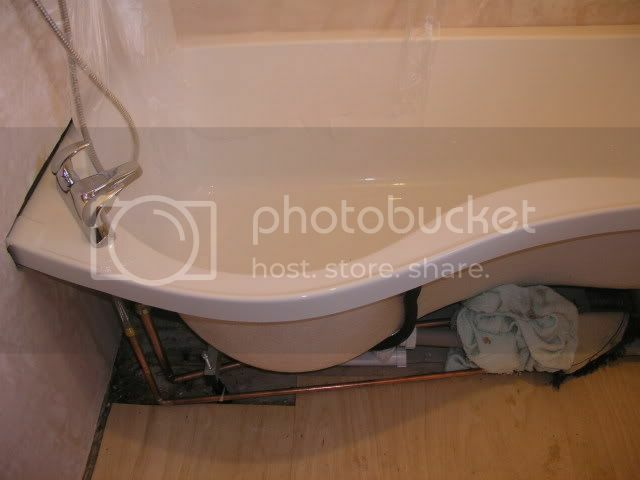 It nearly doesnt leak we also put the side panel on the bath. 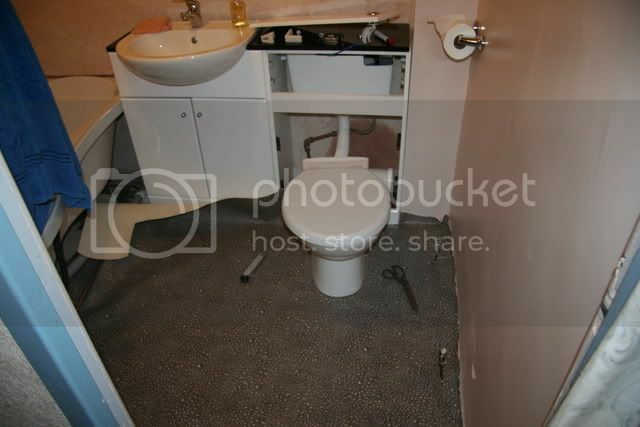 The exclusive Eater pedal bin came from Screwfix, as did the bog brush. The shower has a pump to try and make it a strong power shower, but it aint man enough for the job. We will get a bigger one in a couple of weeks, when Edmundo has fobbed one of his punters off with the old one. Looking good! 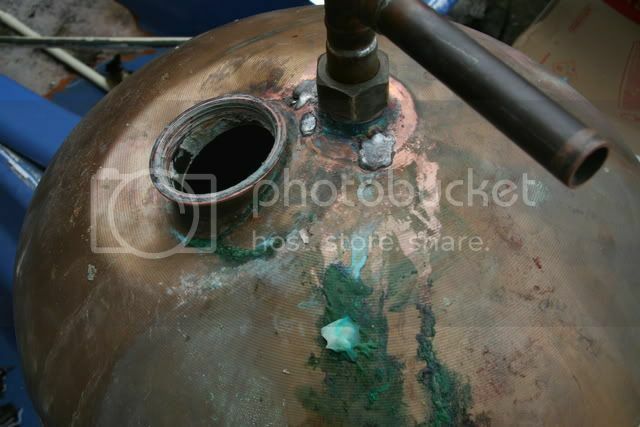 Good ol' copper pipes too. None of that plastic rubbish that will spring a leak in a few years time. Proper copper for Cropper, cocker. No huge updates yet, we await the flooring and the return of Edmundo to fit the radiator, In the meantime its all been painted except for where the tiles are going. In the meantime ParcelFarce have been playing the ususal knock and run, to deliver a cracking Makita 18V hammer drill (�100 off at Screwfix) and zillion piece accessory kit to my neighbours. Now I have got my hands on it, I'm going to fix up the loo roll holder with it. The wall is a layer of plaster over a brick wall, which will need the masonry bit. My question is, if I use 'hammer' mode to drill into the brick, am I going to bugger up the new painted plaster with cracks? I'm off to the tip now, I'll recheck this thread when I get back before I take the drill to the wall. ^^^ With the appropriate disclaimers, no; you'll be fine. You don't need the hammer to get through plaster though, and it may spoil your aim, so I'd start off without and get a few mm into brick before you switch it on. If your masonry bits came in a cheap collection, take it easy and let them cool down very often or they will burn out. Those things are an order of magnitude worse quality than bits you buy one at a time. Don't use hammer unless you actually need it. Quite often internal walls will drill fine without using it. I did need it, this was an external brick wall. It went through it so easy, it used to take forever with my old Black & Decker. But I did buy it in a pub for a few quid 20 years ago. We have a loo roll holder now. Of course one of the tiny grub screws fell out an disappeared down the gap where the skirting board will go. Theres a bigger screw there now - bummer. We have a gale kicking off, so it was outside with the drill to repair the fence! 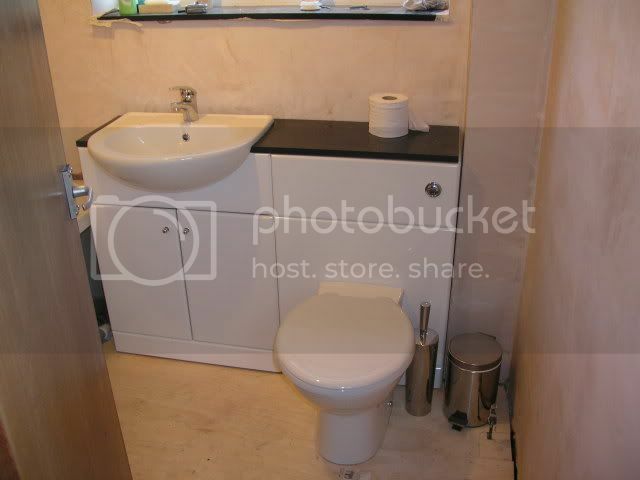 I've never used ply in a bathroom or anywhere around water. I tried floating mud once. I now only use cement backer. They've got hi tech stuff, green board, hardibacker and other stuff but I only use cement backer with hot dipped galvanized screws and then thin set as a mastic. Never had a tile pop, crack, squeek or problems with porous marble such as travertine. The bog blog is back! Nothing happened over the last month, first Edmundo was sent to Azkaban or somewhere by his employers, then we went to Canada for 2 weeks. We got a good few hours at it this Saturday, unfortunately we all went to a party after which involved cocktail recipes that started 'take one bottle of Vodka', so Sunday had to be scrubbed. The loo had to be removed to get the vinyl under it, I then found the screw holes for the brackets by dead reckoning the cutting a cross, luckily they were where I thought. 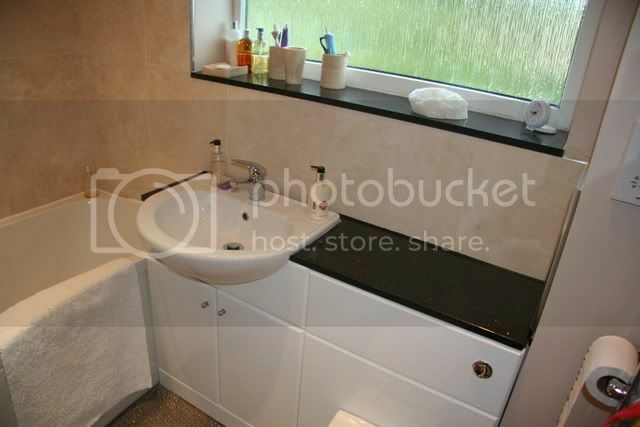 This way is so much neater than cutting round the loo, which is then refixed over the flooring. While we were away Edmundo sold our puny shower pump to another job, and we have since put in one half as big again. 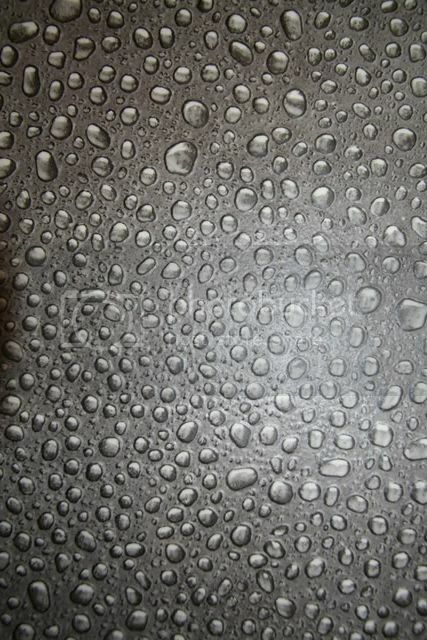 It'll never be a shower that leaves you raw, due to a very limited head for the hot water tank over the pump, but the big monsoon head now dumps a fair deluge on you. This weekend we fixed up the heated towel rail. I had already painted the walls which aren't being tiled, and fixed up the mirror. As well as plumbing in the towel rail, Edmundo also fed some elastic trickery to the mirror. bought this from Costco - you wave your hand at it to switch it on (no switches in wet areas allowed) The mirror has a lamp inside, the frosted squares light up so Hayley can see to paint her eyes on etc. Also, the mirror is heated, so when you have a shower it doesn't steam up. The father in law complained that the loo roll holder is old person unfriendly, but I pointed out he can tear off the strips first, and heat them up on the towel rail! Great job and I especially like the flooring and mirror. 3 years ago we had a new bathroom installed by complete cowboys. Day 1 the builder fell through the bathroom ceiling and nearly landed on me making him a cup of tea in the kitchen below!! 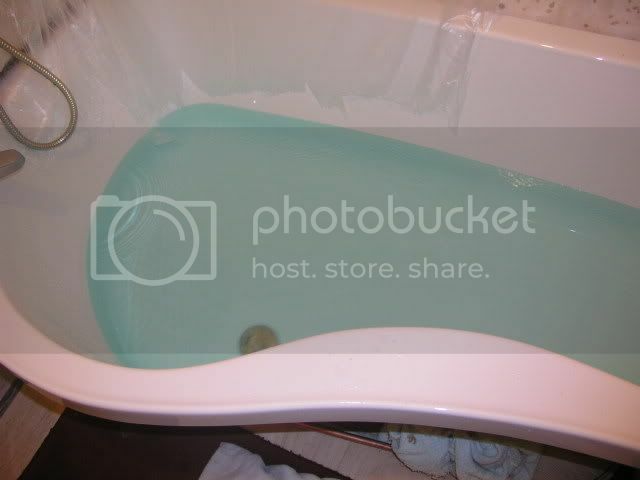 Initially the shower only came out cold then we got hot water too but it wouldnt drain away. The builder suggested we call a plumber!!!! 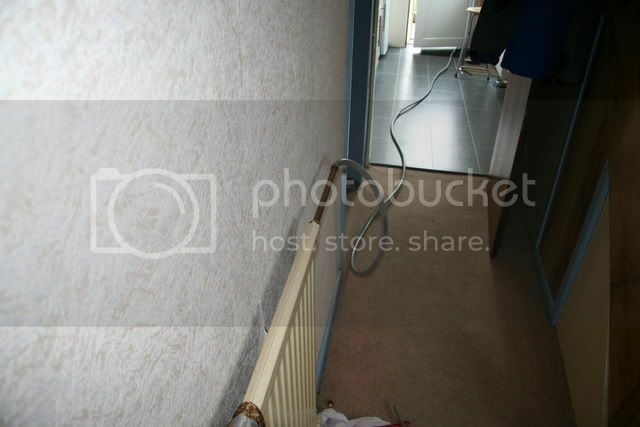 Finally the wc shot across the floor the first time I used it - secured only with bath sealant. @cropper -In reference to your story about someone's travertine tiles falling, I can describe what the tile guys did at our house when they installed 16"x16" travertine. They skipped the first/bottom row. They measured accordingly (I assume) and then nailed a 2x4 to the wall to use as a support for the second row. They started with the second row and tiled up toward the ceiling. They came back the next day and tiled that bottom row, and secured it to the row above with tape (it looked like the blue painter's tape). Thanks. I'll have the Edmeister helping me, not sure if were using the bath or a batten, when we get there I'll know, but tiling is last. Big setback this weekend - by now I should have spotlights, an extractor fan and speakers. In fact, after huge expense and a weekends work we are back more or less where we were before it started. Last week things went wrong, first the ABS light came on on my Jag (being fixed tomorrow). next the timer went on my dishwasher. Usual story, no spares available anymore, new ones horribly expensive. First thing in the bathroom was to replace our faulty thermostat and put a timer switch on the immersion heater just to make sure. Up to now, we knew we had a faulty thermostat, and if Hayley left the hot water on in the morning, UI woke up later to boiling in the loft. After a recent UK tragedy where a baby got covered in boiling water as the loft tank melted, I knew we had to do something. Problem one was that the coppertube where the thermostat lived had vanished, ours went straight into water. So that was a trip to B&Q for a new immersion heater and 'stat. We replaced that and the fun really started - our copper water tsnk leaked like a sieve once the crap that held it together was disturbed. Ed tried soldering it, but new holes kept appearing. Heres the new blue tank in the attic, next to the old one, which was insulated by a motley collection of old coats and curtains, that smelled mouldy. They use polyurethane foam now, the blue stuff. This is the heating being part drained via a downstairs radiator, the hot water from it goes through the tank and warms the tap water up, this circuit had to be drained before pipes could be cut. Ed came back at 8am today, All up and running again, but we are now well behind where we should be. At least Hayley can't boil me alive any more. Bad news indeed, Roy, but you can't mess about with scalding water. I missed the pics from a week ago, though. I love the mirror, and it's coming together really well, isn't it? Well work has continued with the bathroom, it's still not finished, but definitely getting near to being. Thank God. I wont give you the full blow by blow, just edited highlights. 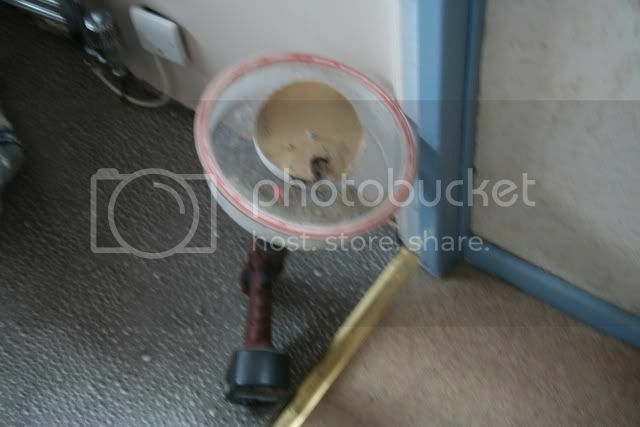 First, cutting holes in the ceiling - a blurry picture of Edmundo's trepanning saw, with a disk of ceiling plaster in it. 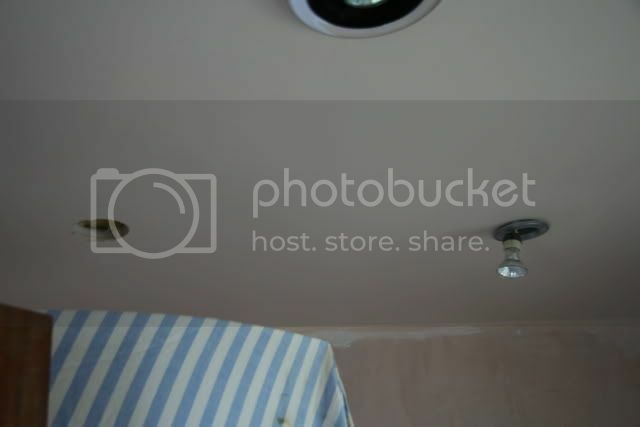 Fitting the spotlights - there is a fused spur in the attic now, which powers the shower pump, fan, heated mirror and towel rail and spotlights. Before, there was only a bulb. 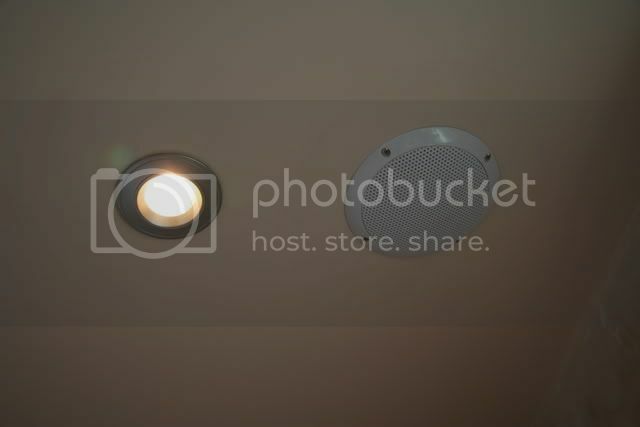 The extractor fan, with a light in the middle, is just visible at the top. 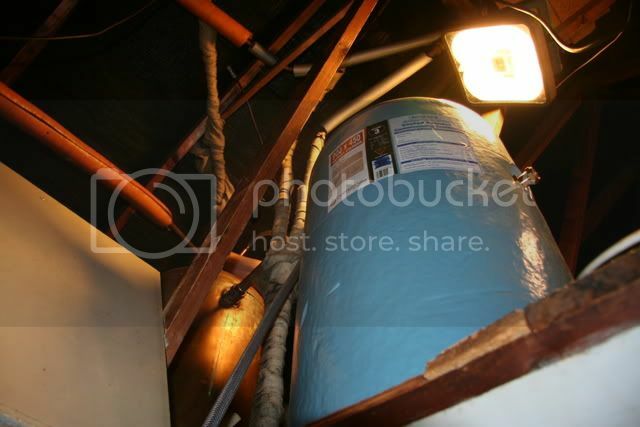 There is a duct across the attic floor to an outlet under the eaves. 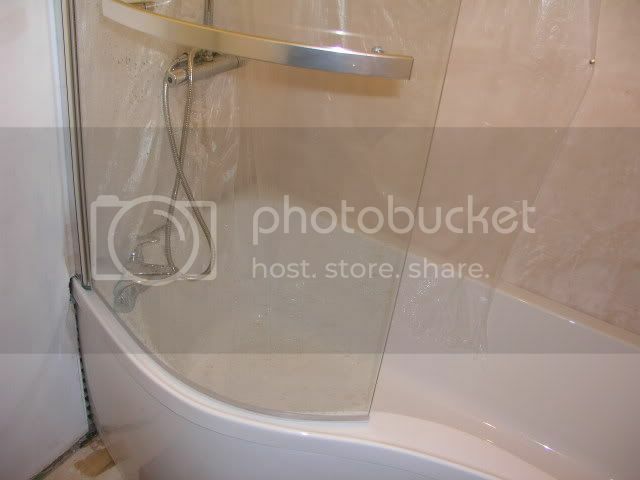 The striped sheet is protecting the shower screen. A finished spotlight, with one of the speakers playing loud rock music which you can't see. Next we fitted the sheets of travertine. 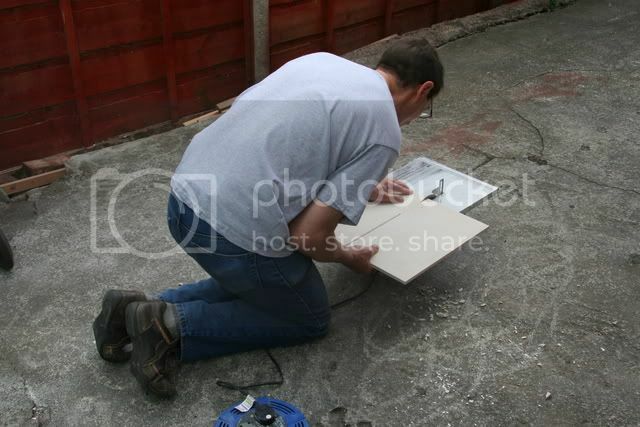 Here's Ed cutting one outside, using a diamond tipped wheel. Tiles and border up, but no grout, still spacers in while it dries. We left it a week to dry before we put any tiles above the border, they were very heavy. Edmundo grouting. We bought a sack of beige grout and another of adhesive on Ebay, with the stone. This is how it stands now, the only unfinished bit is the wall by the shower, we still need to cut 2 holes in a sheet of stone to go over the pipes to the shower mixer, a tricky job.